You can make a difference on your venous system by doing a few simple things which not only improve your leg health, but will ultimately help improve your overall health. Diet – Make sure you eat plenty of fruits, vegetables (preferable raw) and whole grain products each day. Water – Make sure you drink enough water. Adults need 2 liters of water daily. Shoes – Wear shoes with flat heels and flexible soles. Clothes – Avoid tight clothing that constricts in the pelvic and hip area. Control top garments decrease your circulation. Remember gradient compression is what it is all about. Unless you are a lymphedema patient, we want the most compression at the ankle. The compression should get less as it goes down toward the toes and up towards the torso. Sit properly – put as little strain as possible on the underside of the thigh – do not let your legs dangle – a hard seat is preferable. Running on the spot. If you stand a lot at work, try simply running on the spot from time to time. You can work while you are at it and take the strain off your veins at the same time. Avoid heavy lifting. Heavy lifting – such as when shopping – pushes the blood back downwards and puts you veins under additional strain. Try to avoid heavy lifting – take a shopping bag on wheels. You can do the following exercises sitting down without any trouble. If you work at a desk or seated at another type of workplace, you can keep you venous system on the go with a minimum of difficulty. Rolling your feet (right, left, in opposite directions). Tiptoe exercise – with both feet on tiptoe at the same time. As a vein patient, you should organize your leisure time activities to benefit your venous system (regular exercise). Above all, this involves choosing the right sports, the right relaxation and specific gymnastic exercise. Balanced and rhythmic types of exercise and sports are recommended: walking, jogging, swimming, cycling, dancing, cross-country skiing. Sports with abrupt changes in movement are not recommended: Power sports and combatant sports, tennis and squash, downhill skiing and snowboard, ball sports. Relaxation and sleep: When you are resting, put your feet up – about 15 cm higher than your heart. d Sit calmly and breathe, put your feet together and raise your heels until you are on tiptoe, then lower your heels to the floor again. Repeat this exercise up to 20 times. Breathe calmly with both arms supported, stand on tiptoe and lower your heels to the floor again. Repeat this exercise up to 20 times. Lean against a wall with your legs apart and your hands at shoulder height. Stand on tiptoe and lower your heels to floor again. Repeat this exercise up to 20 times. Straddled position: as you breathe in, raise your arms to the side while going up on tiptoe. As you breathe out, go back to the straddled position. Repeat this exercise up to 20 times. Remember your legs have to last you a lifetime. 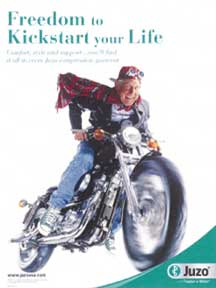 You can kick start your leg health with regular exercise and wear your support hose everyday.